What’s a book tour like in China? The author of a book on Beijing returns. 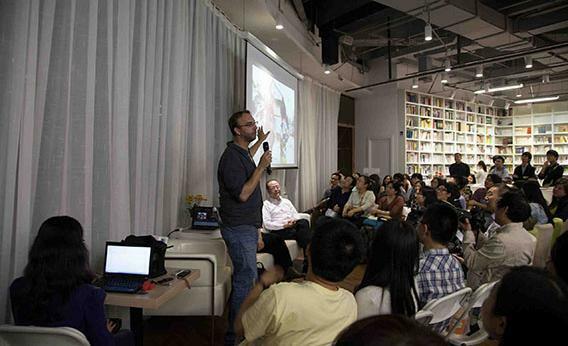 Michael Meyer speaks at the bookstore One Way Street Library in Beijing. In Beijing, where I sit for seven hours each day, meeting journalists one by one, a reporter asks, “What difficulties does a foreign writer face in China?” Answering this question again, I want to respond. “What can China learn from America’s destruction of historic neighborhoods?” Due process, I think. “Is there any time you want to leave China?” Happy to be here, I smile for the camera. I’m nearing the end of a three-week promotional tour for the Chinese edition of my book The Last Days of Old Beijing, which details the three years I lived just south of Tiananmen Square in Dazhalan, the capital’s oldest neighborhood of hutong, the narrow lanes that lattice Beijing like canals do in Venice. With several locals, I had shared a dilapidated courtyard home—sans toilet and heat—recording both quotidian community doings and the largest, looming in the near future: the neighborhood’s destruction as the capital remade itself. The English edition came out five years ago, but in China it was rumored to be banned not for its depiction of the sensitive subject matter of heritage preservation and relocation of residents, but because the introductory map of China shaded the island of Taiwan a different color than the mainland. I’ll never know for sure; writers don’t receive an explanatory letter on General of Administration of Press and Publication letterhead. In 2008, in Berkeley, Calif., at my first-ever radio interview for the English edition, I found myself seated next to the affable Salman Rushdie. After hearing I lived in China, he replied that all of his books were banned there. “Mine, too!” I boasted, with brash bonhomie. Banned brothers! Not anymore. Last year, the book went to auction in China, resulting in both Taiwan and mainland editions. The differences between them are slight but telling: The cover of Taiwan’s is a warning-bright red with the image of a courtyard about to bite the dust, under the headline moniker The Disappearance of Old Beijing. The mainland’s cover is a warm blue image of a three-wheel bicycle against the backdrop of a construction site and the more wistful See You Again, Old Beijing. Place the books side-by-side: pessimism and optimism. Meyer’s book jackets from (left) Taiwan and (right) mainland China. This simultaneous release and tour on both sides of the strait is unprecedented. One of the first questions Taiwanese and Hong Konger journalists and audiences ask is: “What was cut from the mainland edition?” Surprisingly, that’s also one of the first questions mainland journalists and audiences ask. Also surprisingly: Very little was cut. Of the book’s 400 pages, less than one page was excised: the artist Ai Weiwei cursing Beijing’s leaders (though not a paragraph noting how he distanced himself from the Olympic Bird’s Nest stadium as a piece of propaganda). An entry from the neighborhood’s official gazetteer noting the local government office’s actions at the climax of 1989’s demonstrations centered at Tiananmen Square. Funniest was a pair of text messages sent by an American architect at a municipal planning meeting, noting the presence of a teenage mistress noisily sucking a lollipop on the arm of a middle-aged man. The follow-up text read: “Update: man is the mayor.” Gone. Of course, an author being published in China does not know why something is cut or by whom. Your manuscript comes back with the changes, take it or leave it—and some authors have opted out, notably Peter Hessler with Oracle Bones, though his other books have been translated into Chinese with cuts similar to mine. Even these minor cuts felt major at the time—since mollified by readers’ responses to the content that remained. Better 400 pages of book than no book at all. In China, you take what you can get. The television and radio interviews are more spontaneous, even at the Beijing headquarters of China Radio, where getting to the studio required me to pass through not just the main gate manned by an armed soldier but also guard posts with armed soldiers on every floor of the building. It made me feel like I was bearing a message of great import. Instead, the host and I talked about using a public toilet and bathhouse in the lanes. I do the interviews and talks in Chinese. When each is over, the book’s translator presents a piece of paper listing every word I pronounced incorrectly. The irony is that audiences would often prefer to hear me speak English. At National Taiwan University I use English; at Taipei’s Eslite Bookstore I try a hybrid of Chinese and English that pleases some: “I can tell you first learned Chinese in Sichuan,” an elderly man says during question time. “Your pronunciation sounds just like a peasant’s.” Hong Kong’s audiences would prefer to hear Cantonese, while Peking University’s packed lecture hall wants Chinese, because several attendees are older, native Beijingers—campus janitors, cafeteria workers, groundskeepers—who, at last, can hear a lecture about a subject they know intimately. That talk ends with a spirited question time filled with their testimonials of evictions and a burgeoning nostalgia for the 1950s walk-up apartment blocks starting to come down. It reminds me how writing a book is like building a boat: Once it’s launched, all that matters is whether it floats, not what its creator intended to craft. Chinese readers see a book not about the protection of historic architecture but a plea for affordable housing, sensible urban planning, and the ability for migrants to settle in large cities. When I first opened the crammed spreadsheet detailing the tour’s schedule, I thought that including co-panelists at events meant having someone onstage—like those Central Radio soldiers—to prevent talk from flowing too freely. But it was the opposite. The talks weren’t scripted presentations but two-hour forums that gave a platform to professors, preservation activists, and intellectuals such as Liu Suli, who spent 20 months in prison for his role in 1989’s protests. All were critical of Beijing’s remodel; most expressed embarrassment and sadness that a foreign writer was the one who moved into the hutong to record it. Not everyone agrees. At a Hangzhou bookstore, a wealthy, well-fed man confesses he has not read the book but came to tell everyone that development was the correct principle, and Chinese should not labor to preserve fossils such as the hutong, which were really just slums. My co-panelists—a Southern Weekend journalist and an author—relish taking him on, and for more than a few minutes I eye the room’s only exit, a precarious staircase that wouldn’t withstand a crowd fleeing a brawl. Yet the tour has filled me with optimism about China that my decade in Beijing had extinguished. The book was published; a tour was arranged; people came, stories appeared in the press. I couldn’t imagine the opposite occurring—say, if a Chinese author toured the U.S. to promote her book criticizing the development of New York City. But nor could I, at tour’s start, imagine that a writer—a foreigner, true—could stand in front of audiences of 400 people and talk about what was censored and why I left Beijing. On my last day in the capital, I sit for a press conference at One Way Street, a bookstore popular with the capital’s intelligentsia. The store is in a massive new mall named Joy City in the rising suburbs of east Beijing. During a break, I descend through Joy City’s third floor, to the second, then the first, searching for an exit amid the Starbucks and Sephora. Outside in the already hot, early summer sun, the vista is New Beijing: wide avenues clogged with honking traffic; freshly sprouted apartment blocks; and directly across the street from Joy City, a row of temporary, red-brick lean-tos filled with construction-worker dormitories, dumpling stands, and shops selling sundries such as shower sandals and sieves. While slurping the best bowl of knife-shaved noodles I’ve had on this tour, made by hand by a migrant from central China, the other diners—flip-flops and sagging white tank-tops and words that end in mushy R’s—make friendly small talk about the heat, housing prices, and traffic. It’s all eye-contact and presence; no one stares at a cellphone. Every daily need is within a five-minute walk, including a subway station, and everything is cheap. Outside, on the dirt bordering a freshly poured curb stand flatbed tricycles selling in-season watermelons, pirated movies, and—here—pirated best-selling books. A fleeting thrill: What if I’m a knock-off! I scan past the diet books and titles with “secretary” in their names. No See You Again, Old Beijing. The watermelon looks good, though. “Fresh from Daxing!” the seller promises. “Bu tian, wo bu yao qian”—if it’s not sweet, it’s free. I chomp and slurp at a slice loping back to Joy City, to the air conditioning, to the escalators, to the bookstore, where a packed audience fed up with the heat, housing prices, and traffic will ask, skeptically, if there’s anything left to love about living in Beijing.